All these examples are available here. You’ll see the footnotes you created in Excel are at the bottom of the Wiki page. It looks different at Wiki Commons, but the code still works. Examples of a tables I made there with MakeWikiTable() are these. You’ll see it uses a sideways arrow instead of text for hide and show. If Len(CellContents) = 0 Then CellContents = " "
If IsNumeric(Cell.Value) Then TextAlign = "right"
If IsError(Cell.Value) Then TextAlign = "center"
sReturn = sReturn & "|align=" & TextAlign & "| "
If .Italic Then sReturn = sReturn & "''"
If .Bold Then sReturn = sReturn & "'''"
Note that the Caption is at Offset(1,0) from the your selected table. Wikipedia’s examples all use muted grays for the headers. The first two of the following are the provided colors, the third, aka “silver” is what I used above. The macro should be invoked from a form instead of daisy-chained message boxes. I got lazy. The MakeFracs() function is here. If you want to put something in the upper-left cell, and still get row headers, put it in after you paste your table into Wikipedia. This is my very ugly, very formatted, table to test my translation skills, first into HTML and now into CSS. Every cell has at least two formats that have a counterpart in CSS, and the table runs through all options at some point. I think Microsoft Office puts those fonts on every machine. A1:H5 are the colors of the old/original color pallate. This is my CSS rendering of the double-ugly table. Tricks were required to capture conditional formatting, which is not contained in a cell’s styling. From here, Chip Pearson showed me the way. The mental picture I formed was of conditional formatting floating in a horizontal plane above the spreadsheet, hiding the “regular” formatting below it. Reverse engineering the way cell formats interact with conditional formats was not fun, but the result should be near to what you see in your spreadsheet. Several cells in Row(7) are conditionally formatted. Browsers can screw this up. The bottom border of E10 is a dotted red line. 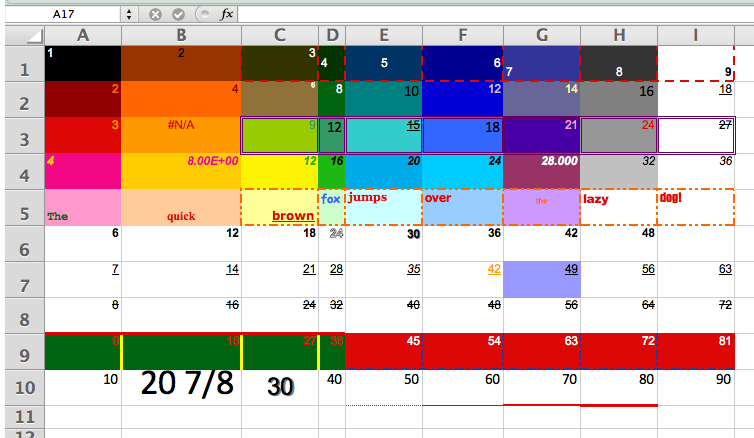 It’s set as xlHairline in the spreadsheet. The HTML properly specifies it as a dotted red line, and outside of WordPress, that’s what I see. Just not here. Similarly, I’ve specified the column widths and their max-widths. WordPress doesn’t seem to care, and spreads the table 100%. My impression is that inline styles win, but not always on WordPress, I guess. The graphic is about 70KB and the table about 57KB. While the graphic will be always be around 70KB, the table will shrink as formatting is lessened. For the 120 cells above, which includes the heading cells, that’s about 486 bytes per cell. To speed the concatenation up, I implemented (the late) Nate Oliver’s buffer concept, with a buffer for 106 characters, or room for over 2,000 excessively formatted cells. The MakeCSSTable() procedure looks at the selected cells from left to right, top to bottom, and aligns each cell’s attributes with CSS. Except for the optional case of not capturing the headers, only the bottom and right borders are captured (the left and top being captured from a previous cell). When no-headers are chosen, all four borders are captured for the top row and left column. Someone please speakup if it’s documented what the layout or z-order for Excel’s cells is, and how their borders overlay. I think I got close to right, but since the browsers may do it differently, I’m not sure. If you change your gridline settings, MakeCSSTable() follows along. My initial approach gave a CSS style for each attribute on each edge. As I got smarter, I grouped the the attributes into shortcuts. Not every Excel attribute has a CSS counterpart. For instance, diagonal borders do not exist in CSS, CSS only offers one kind of underlining, CSS3 adds an outline font but browsers don’t handle it yet (see Cell(D6)—it’s in the macro though for when they do), and Excel has more dashed/dotted line styles than CSS. Predominately dashed styles align to a “dashed” CSS style, with a similar arrangement for dotted lines. Things I stumbled upon in doing this: Column widths are a pixel measurement (based on the Normal-style font size) and row heights are a point measurement. For small Excel font sizes (<11) I specified a CSS use of a value of “small” in one line’s code. Since this is outside what Excel calculated, it can throw the column widths off. You can see the difference in the G5 cells. The CSS_Tablemaker module is 700+ lines of code, including the whitespace, so it’s available here as a spreadsheet file. It comes complete with the MakeCSSTable(), AddToBuffer(), MakeFracs(), and HexColor() routines, and as much of Chip’s code as I used. The absolutely stunning tables above are included, no charge. The header details are module constants you can adjust. The output is dumped to the clipboard to paste where you want. 2/1 2/2 2/3 2/4 2/5 2/6 2/7 2/8 2/8. Cell D1: =CHAR(32)&ROW()&”/”&COLUMN()-3, then fill down and right. The right hand column has a few test cases. I used that formulaic construction to keep Excel from doing the divisions. The Excel fractional format is “# ?/?” for single digit denominators. The intermediary space is important. It indicates that a fraction may follow, just as a forward slash indicates a fraction may be present. And a format of /?? is a fraction not translatable into HTML5. Turning these patterns into VBA, this is my MakeFracs() function. It checks that there is a slash, then that there is not a slash–digit–digit pattern, and finally that there is a “space–digits 1 through 7–slash–digits 2, 3, 4, 5, 6, 8” pattern to screen out sevenths and ninths. If all of those pass, it substitutes in the &fracnd; formulation for the fraction. Fracs(1, 1) = "½": Fracs(1, 2) = "½": Fracs(1, 3) = "½"
Fracs(2, 1) = "&frac13;": Fracs(2, 2) = "⅓": Fracs(2, 3) = "⅓"
Fracs(3, 1) = "¼": Fracs(3, 2) = "¼": Fracs(3, 3) = "¼"
Fracs(4, 1) = "&frac15;": Fracs(4, 2) = "⅕": Fracs(4, 3) = "⅕"
Fracs(5, 1) = "&frac16;": Fracs(5, 2) = "⅙": Fracs(5, 3) = "⅙"
Fracs(6, 1) = "&frac18;": Fracs(6, 2) = "⅛": Fracs(6, 3) = "⅛"
Fracs(7, 1) = "&frac23;": Fracs(7, 2) = "⅔": Fracs(7, 3) = "⅔"
Fracs(8, 1) = "&frac25;": Fracs(8, 2) = "⅖": Fracs(8, 3) = "⅖"
Fracs(9, 1) = "¾": Fracs(9, 2) = "¾": Fracs(9, 3) = "¾"
Fracs(10, 1) = "&frac35;": Fracs(10, 2) = "⅗": Fracs(10, 3) = "⅗"
Fracs(11, 1) = "&frac38;": Fracs(11, 2) = "⅜": Fracs(11, 3) = "⅜"
Fracs(12, 1) = "&frac45;": Fracs(12, 2) = "⅘": Fracs(12, 3) = "⅘"
Fracs(13, 1) = "&frac56;": Fracs(13, 2) = "⅚": Fracs(13, 3) = "⅚"
Fracs(14, 1) = "&frac58;": Fracs(14, 2) = "⅝": Fracs(14, 3) = "⅝"
Fracs(15, 1) = "&frac78;": Fracs(15, 2) = "⅞": Fracs(15, 3) = "⅞"
2/1 2/2 &#8532; &#189; &#8534; &#8531; 2/7 &#188; &#188;. 2/1 2/2 ⅔ ½ ⅖ ⅓ 2/7 ¼ ¼. Frankly, I'm not sure that this is an improvement. You'll come across Wikipedia editors, however, who are convinced of it. I thought about adding a trailing space, as in MakeFracs = VBA.Replace(Arg, sOUT, sIN & Chr(32)), but for every time I wanted to, I thought of an example where I didn't, and the logic got very convoluted. Better I decided to put the space in the table where wanted and not in the function. My HTML tablemaker is here, but it's being overcome by the hard steady march of technology. Wiki and CSS tablemakers are coming up. I used MakeFracs() in the above. No fractions were harmed in the making of this post. Excel’s MATCH() function will return the relative location of the first occurrence that satisfies the match criterion (the lookup_value) within the specified array (the lookup_array). Most often, this is what you want. For instance, if you have duplicate entries, returning the first match is no different than returning the last match. However, if you have unique entries with the duplicated criterion, how do you return all the unique values? For no good reason we want to create a descending sort on name length. You can do it from the Sort selection, but we also want to keep the alpha-sort. In F1 you put =LARGE($E$1:$E$122,ROW()) and fill down. The ROW() function will cause the return of the first largest, then the second largest etc. Then you want to know how far down Column E those descending numbers fall, so that you can Index the name list that amount. In G1 put the code =MATCH(F1,$E$1:$E$122,0) and fill down. You’ll see from the data that the longest name is 29 letters, and it’s in ROW(52). and fill down. If the value did not repeat, just copy it over; and if it didn’t, we’re making a “sliding range” that starts one row after the start of a repeated pair, ends at the end of the data, and “slides” down Column E. The sliding range is made by the INDIRECT() function. It builds the range one row down (H1+1) from the first of a repeating match. We add H1 to that result, and we have our index down Column D. This may be better seen in H3, adjacent to G3, where the first repeat starts. The names are now sorted by length, by alphabet. INDIRECT() is volatile, so there is a penalty for this. For extra credit, and no peeking, what’s the shortest name?